I was born in the North of Spain and brought to the South, lived in Granada's coast since I was a day old. I'm adopted and without knowledge of biological family. This influences my work in my choice to work with different earths, as I find these materials to ground my energies and emotions. My practice is an ongoing dialogue with materials I mainly source from nature. Responding to their qualities and colours, I layer, erode, polish and build up the surface in a process of creation and destruction that intends to echo the natural forces that shape a landscape. Each piece takes a very long time. The resulting works are inmediate, tactile, weighty objects inspired by the abstract patterns found in nature. I'm interested in the vibration that colours have when placing them beside each other, addittionally I sometimes play with the ambiguity of micro and macro scales, inviting the viewer to alternate between them. Earlier education in Spain and USA. BA Hons fine arts at Ruskin Anglia University, Cambridge, UK. Graduate of Leith School of Art in Painting, Edinburgh, UK. I show my work in joint exhibitions, like the VAS annual exhibition at the National Galleries a couple of times. Only 1 or 2 works at a time as the process to make them is extremely long. I also sell privately, please get in touch if you'd like to come to my studio and see how I work. 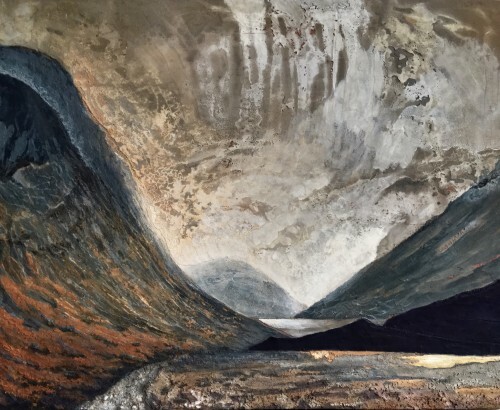 "Oscuridad y Esperanza", Glen Coe.